This template offers three separate page layouts: homepage layout, interior page one column layout, and interior page two column layout - set each individual page to the layout you prefer for that page. Editable PSD files included for easy customization of logo and custom, graphic buttons (including slide images with editable text). All photos featured in the in the live demo (click the button above to view) as well images on the preview pages to the right are included. All images are designed to be easily replaced with your own (if you prefer, right through your WordPress admin). Theme is widgetized so you can move widgets around the page easily. All fonts used in design. The ideal counseling website offers a compelling, inviting, calming virutal ethos for potential and returning customers, while also serving up functionality that makes web editing and web management simple and intuitve. 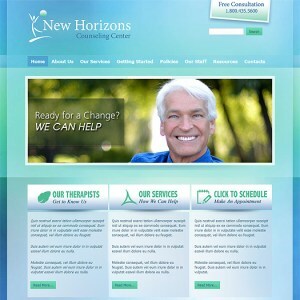 Both of these goals are achieved with this new responsive WordPress therapist theme from CMSTF. CMS Themefactory © 2017. All Rights Reserved.